After a short visit to West Sumbawa, I made my way to Sumbawa Besar to visit Taman Bacaan Pelangi [Rainbow Reading Gardens]. The journey itself was memorable. Together with Subhan, our volunteer, we waited for the bus in Taliwang with the route to Alas. The bus driver said, “We’re leaving soon”, but I guess “soon” to him meant two hours later. So, there we were… waiting in the street, feeling helpless. But, it was the last bus of the day, so we had no other option. Two hours passed. Finally the bus was ready to leave. But then we found that this bus would make a stop in Tano Harbour, which was only 40 minutes away. OMG… if we knew it didn’t go straight to Alas, we would’ve just went to Tano Harbour by our friend’s car earlier! Damn it. People said that it would be better for us to stop at Tano Harbour since we still needed to continue our journey by a mini bus. There were more options for us at the Tano Harbour, we just had to wait for the ferry that arrived from Lombok every hour or so. Subhan, our volunteer, fell asleep and as soon as we arrived in Tano Harbour, the bus’ staff tapped his shoulder and said, “You’re here at Tano Harbour”. 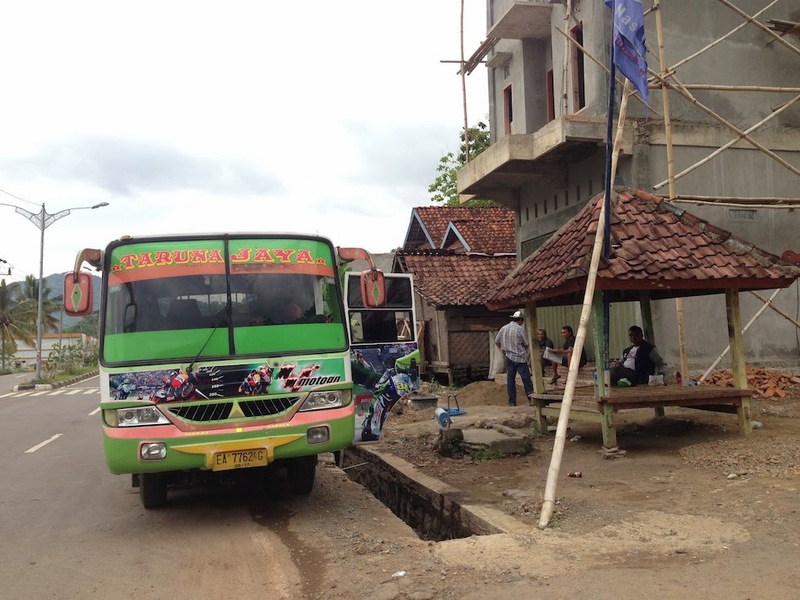 Subhan was surprised and instead of taking a few minutes to get himself together, he got off the bus right away and ran to the other bus that he thought would be heading to Sumbawa Besar. That bus left. Maybe that bus wasn’t going to Sumbawa Besar. 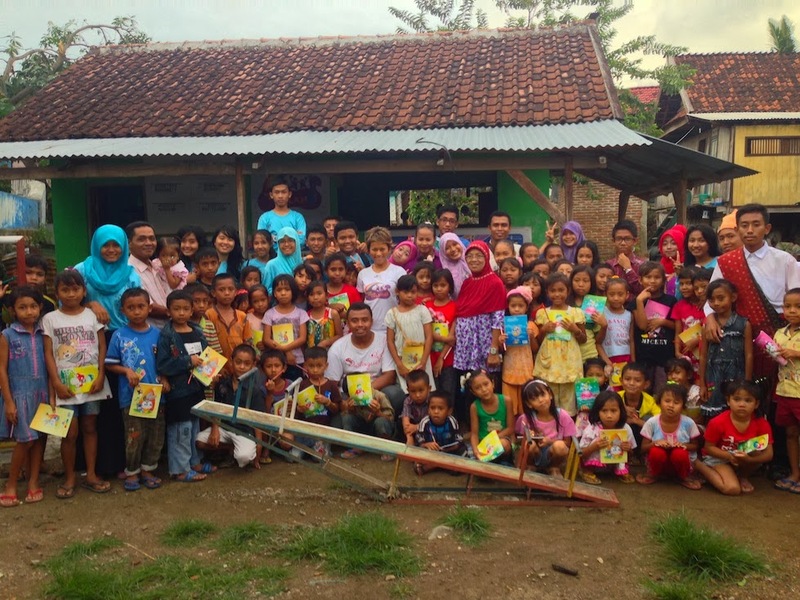 And it left Subhan standing alone, next to the boxes full of books that we brought for Taman Bacaan Pelangi spot in Sumbawa Besar. Ten minutes later, Subhan panicked and asked me, “Mbak Nila.. where’s my bag?” I said, “I don’t know. Where did you put it?” Feeling puzzled, Subhan tried to remember where his bag was. “OMG. I left it on the bus!! !” Shooot!! Some locals heard him panicking and one of them who owned a motorbike offered to help. He worked at the harbour as a ticket jokey. So, he ran with his motorbike heading to Alas, trying to catch our bus! Slim chance he would catch that bus, I thought, considering the crazy speed that bus ran. It was already 6pm and we’re pretty lucky to get two seats in a comfortable mini bus going to Sumbawa Besar. 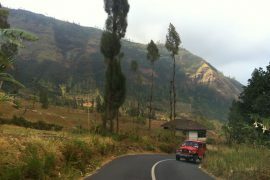 The road was smooth (unlike the roads in West Manggarai, Flores!) and the mini bus has AC, so I could get a little snooze. 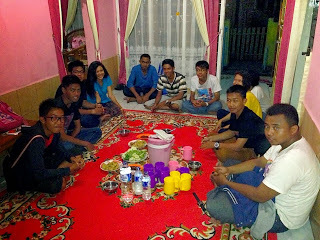 We arrived in Sumbawa Besar at 8pm and was greeted by a bunch of local youths who were members of Forum Anak Samawa. They’ve been waiting for us since noon, they said! Oh wow!!! That night, I stayed at a pink house that belongs to Ika, one of Forum Anak Samawa’s members. The house was cute with its pink walls and pink curtains. We had dinner together with the menu of fried tofu and some vegetables. Everybody ate with their hands. That’s how the locals eat. Nobody used spoons and forks. Somehow the food tasted better if we eat with our hands :). I wondered where did the local youths hangout at night in Sumbawa Besar? As if they could read my mind, the Forum Anak Samawa’s members asked me to go out with motorbikes and cruise around the town. With over 10 motorbikes, we took off and they showed me where their schools were, the city lights, etc. The trip ended at Lapangan Pahlawan, the hangout spot, which was actually a soccer field! People hangout in the terraces around the soccer field. There were some street vendors selling steamed peanuts, coffee and tea. We spent our night chatting over tea and 3 huge bags of peanuts. Suddenly I felt like I was in high school again. Ha! 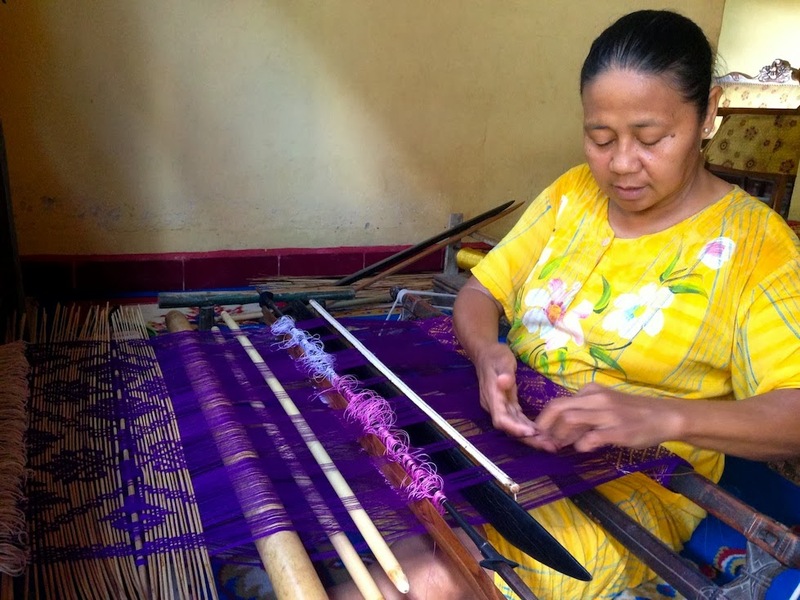 The next morning, I made my way to Poto Village to witness the process of weaving. 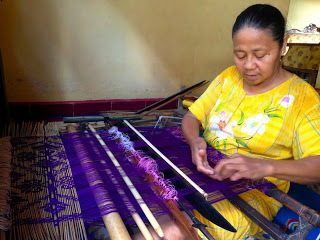 I wanted to buy some traditional tenun ikat from Sumbawa Besar for my Mom. But I was surprised that there were not that many supplies! 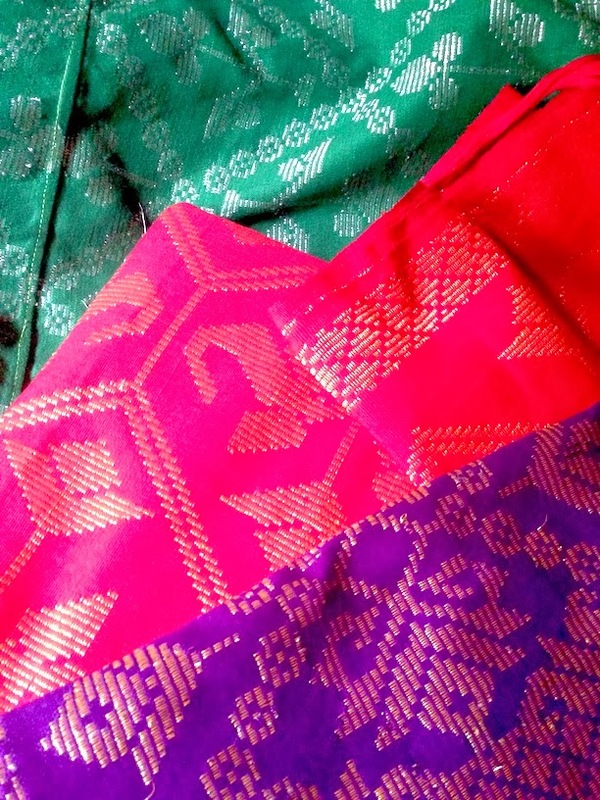 A few ladies in their houses made tenun ikat, but they didn’t have that many stocks. One lady only had one or two. Not much. And to make 1 sarong, it took them at least two months. 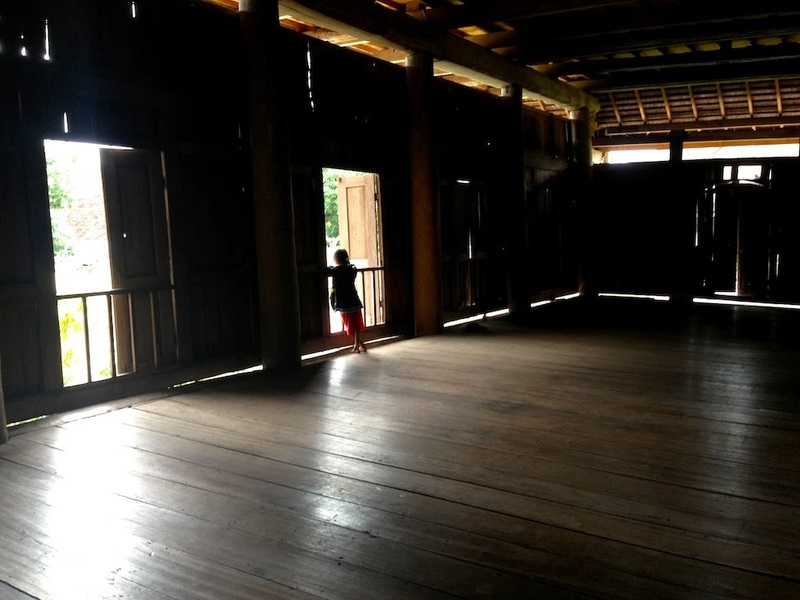 A must visit place in Sumbawa Besar was Istana Dalam Loka. Istana means palace. 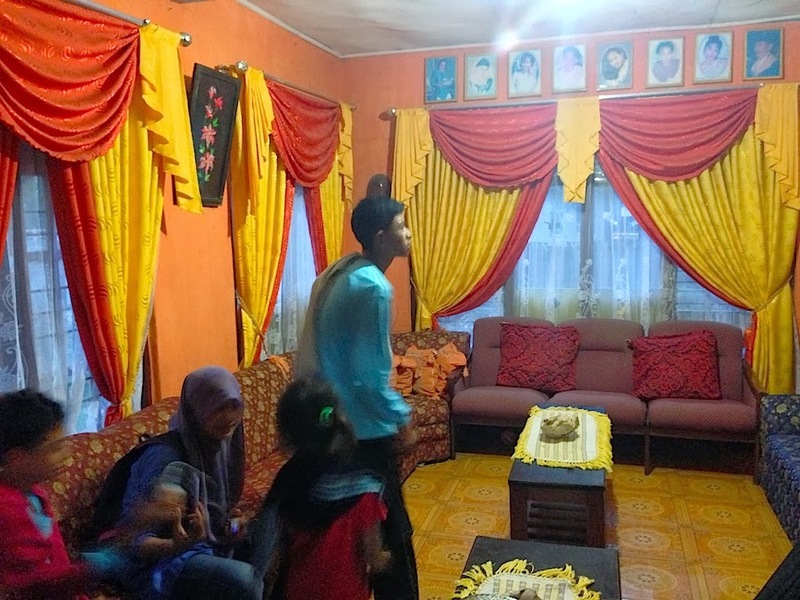 Dalam Loka means the house of King. 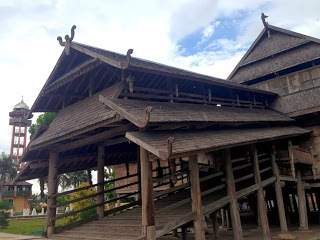 It was built in 1885 by Sultan Muhammad Jallaludin III and was used as the house for the kings of Sumbawa Besar. The 696.98 m2 building was made of wood and divided into different sections for different functions. For example, the second floor was used for the kings, princes and princesses to view any traditional performances that were held outside the Palace. There were windows overlooking the big yard of the Palace and traditional performances/celebrations were held at the yard, while the royal family would enjoy them from the windows. Istana Dalam Loka has 99 pillars that symbolised 99 characters of God. And to enter the palace, there were some staircases that would make your body bowing. It symbolised that everyone should respect the king. Neat! Now the palace was pretty empty, the new king didn’t live here anymore. But the upside was people could come and visit the palace anytime. There was a guy who lived at the back of the palace that kept the door key if you found the entrance door was closed. He would open it for you :). 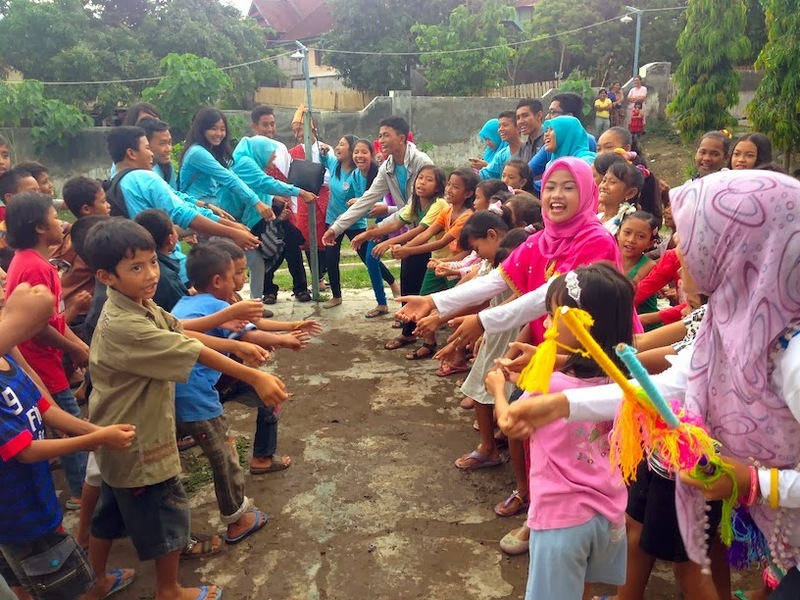 After visiting Istana Dalam Loka, we headed to Semamung Village to visit Taman Bacaan Pelangi [Rainbow Reading Gardens]. 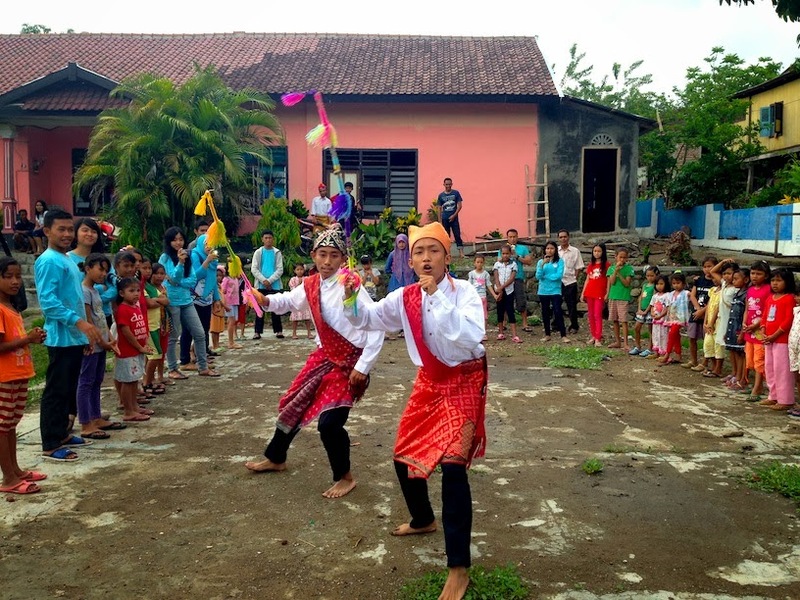 Our volunteers have prepared some traditional performances to entertain the kids. It was so much fun! I loved it. We also played some games together. Everybody looked happy. So much laughters that day :). 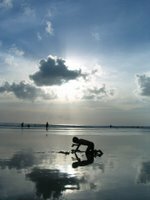 I only spent two nights in Sumbawa Besar, but even though it was only a short visit, it was sweet and memorable. The people were all nice and most importantly, our volunteers who helped Taman Bacaan Pelangi were passionate and I could see the sparks in their eyes when they played with the kids. And those sparks were always a good sign! 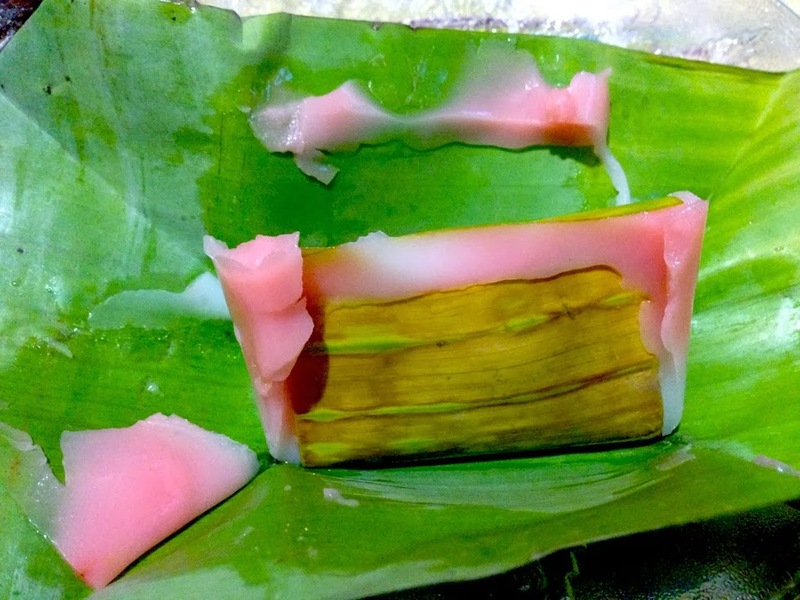 In a short visit to Mbak Endang, our volunteer, ‘s house, she served us some local snacks and I loved the name of this one: “Kue Janda Berenang”. 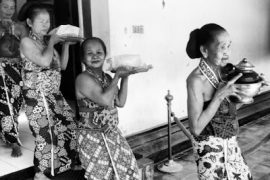 Kue means cake. Janda means widow. Berenang in Sumbawa language means leave/go. So, basically this cake means A Leaving Widow cake. Ha!!! Awesome. Legend has it that there was a widow and she left the house in the middle of making this cake and never returned. Despite the weird story, this cake tasted sweet and has quite an appealing colour: a mixture of pink and white. So girlie!!! On my last dinner in Sumbawa Besar, Ika’s family made me “Sepat”, a traditional dish from Sumbawa Besar. This was their favourite dishes and Ika said everybody always has Sepat during breakfasting in the fasting month. 30 days straight of eating Sepat! 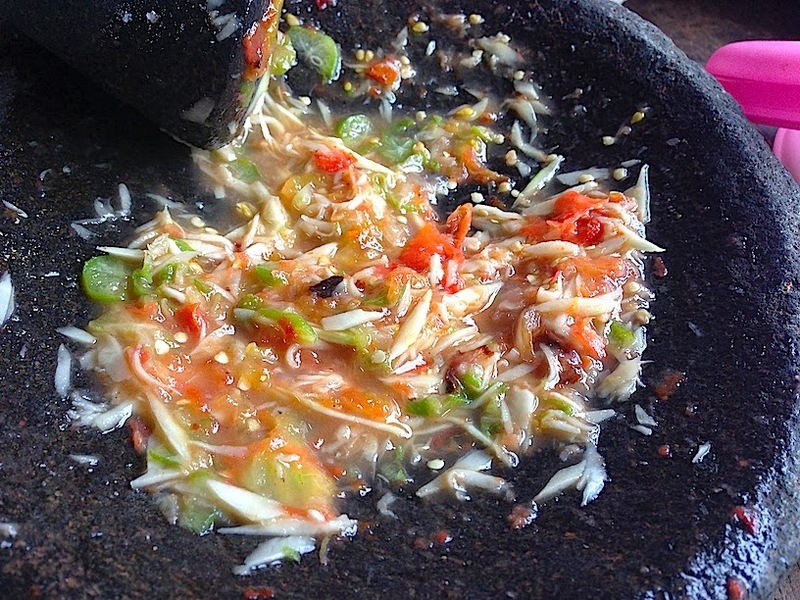 And this was the dish that people would miss if they migrated to other areas of Indonesia. It was hard to get and I’ve never seen any restaurants selling Sepat, not only else where, but even in Sumbawa Besar! People said that you have to make it at home :). 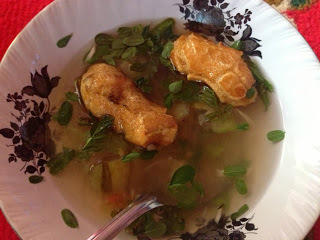 Sepat has a sour taste and it reminded me of Thai’s Tom Yam Soup. It’s made of eggplant, tomato, onions. All grilled. Then, mango, starfruit and crackers that made of buffalo’s skin. Everything was mixed together and you put it into water with some local spices. What an exotic dish! Tasting Jakarta… Eating and Dancing! 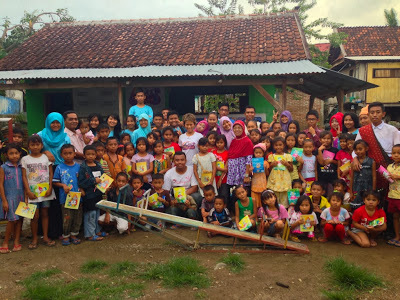 Ikut saya membangun perpustakaan buat anak Indonesia yuk! 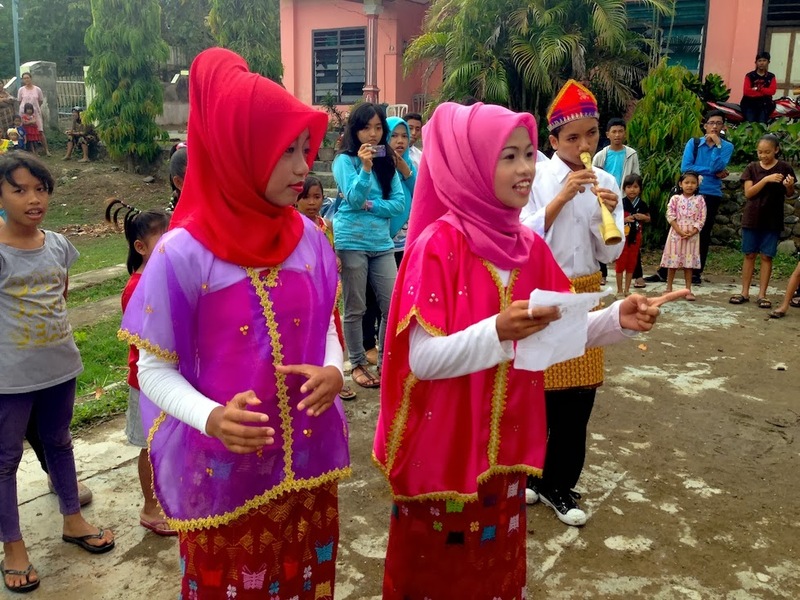 Jelajah Pulau Komodo bersama saya dan jadi relawan juga! Ikuti saya di media sosial!